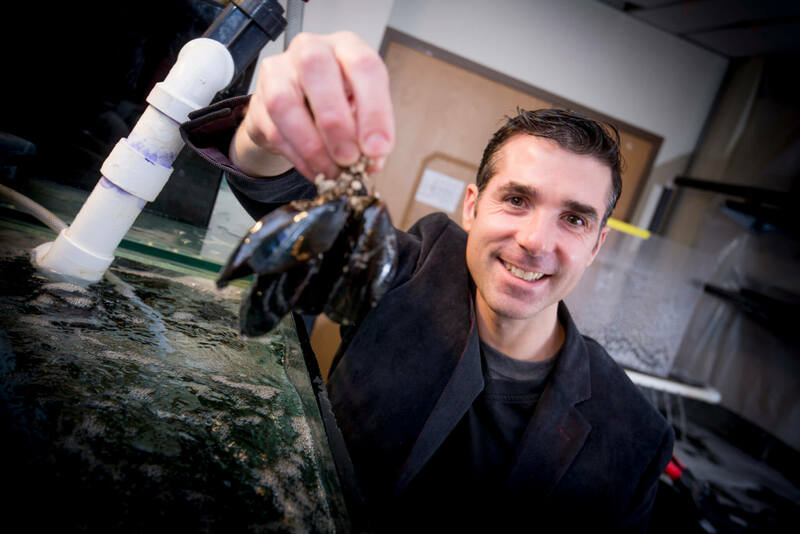 Inspired by mussels’ natural stickiness, Jonathan Wilker, is creating new medical super-glues that work well underwater. Photo by Vincent Walter. An adhesive that works under water and is modeled after those created by shellfish to stick to surfaces is stronger than many commercial glues created for the purpose. 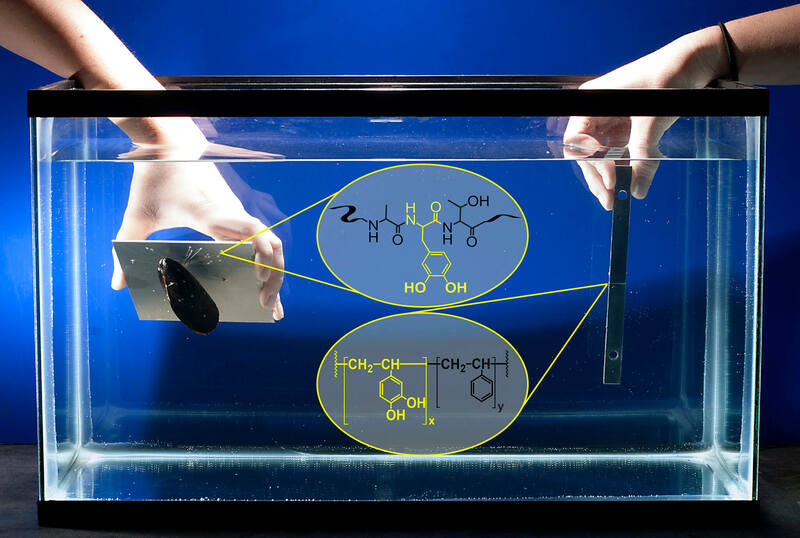 “Our current adhesives are terrible at wet bonding, yet marine biology solved this problem eons ago,” says Jonathan Wilker, a professor of chemistry and materials engineering at Purdue University. “Mussels, barnacles, and oysters attach to rocks with apparent ease. In order to develop new materials able to bind within harsh environments, we made a biomimetic polymer that is modeled after the adhesive proteins of mussels. New findings showed that the bio-based glue performed better than 10 commercial adhesives when used to bond polished aluminum. When compared with the five strongest commercial glues included in the study, the new adhesive performed better when bonding wood, Teflon and polished aluminum. It was the only adhesive of those tested that worked with wood and far out-performed the other adhesives when used to join Teflon. Findings are detailed in a research paper published online in February and in the March 1 print issue of the journal ACS Applied Materials and Interfaces. ating an adhesive by harnessing the chemistry of compounds called catechols, which are contained in DOPA. While most adhesives interact with water instead of sticking to surfaces, the catechol groups may have a special talent for “drilling down” through surface waters in order to bind onto surfaces, he says. The series of underwater bond tests were performed in tanks of artificial seawater. A YouTube video is available at https://youtu.be/rhblikR3SBU. Surprisingly, the new adhesive also proved to be about 17 times stronger than the natural adhesive produced by mussels. “In biomimetics, where you try to make synthetic versions of natural materials and compounds, you almost never can achieve performance as good as the natural system,” Wilker says. One explanation might be that the animals have evolved to produce adhesives that are only as strong as they need to be for their specific biological requirements. The natural glues might be designed to give way when the animals are hunted by predators, breaking off when pulled from a surface instead of causing injury to internal tissues. The research paper was authored by former doctoral students Michael A. North and Chelsey A. Del Grosso, who have graduated, and Wilker. Future research will include work to test the adhesive under real-world conditions. “We have shown that this adhesive system works quite well within controlled laboratory conditions. In the future we want to move on to more practical applications in the real world,” Wilker says. The research was funded by the Office of Naval Research.